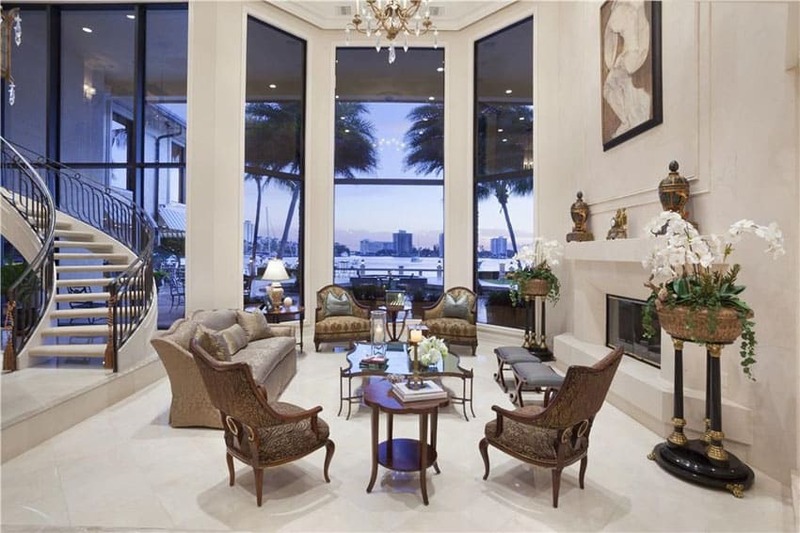 Welcome to our gallery of sunken living room ideas. 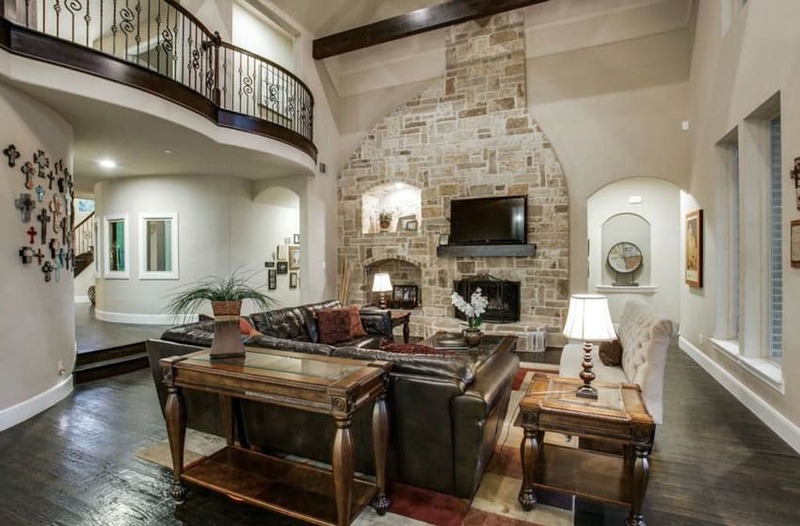 Sunken living rooms are ideal for creating a cozy living environment inside of a larger space. Often found in contemporary and modern home designs with open concept layouts. 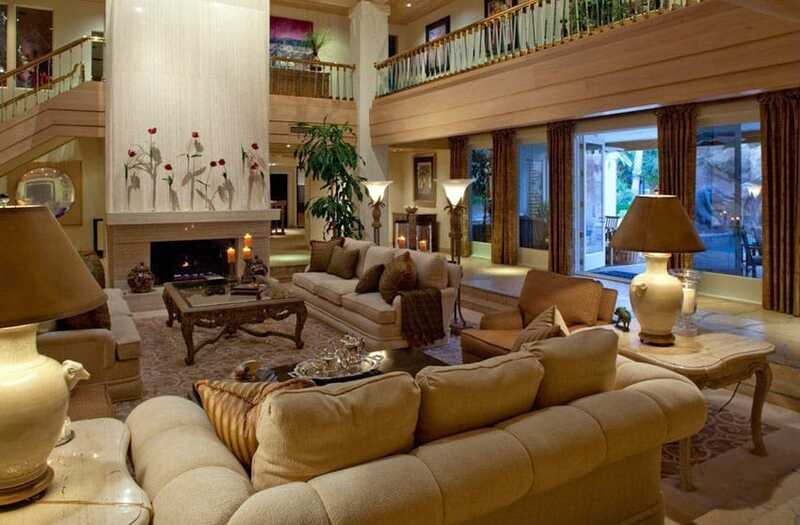 A sunken living room can help emphasize a space and create a luxurious feel. Many sunken living areas utilize custom built-in furniture to match the exact look the homeowner desires. 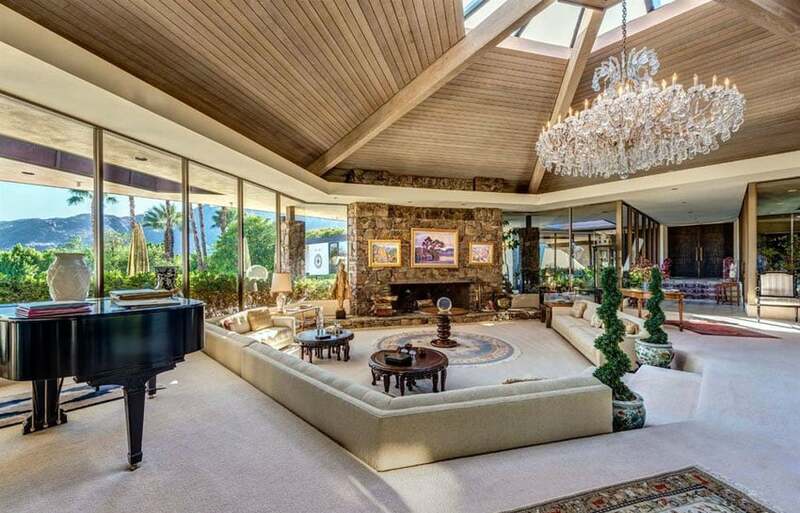 The sunken living room in the picture above is part of a massive open layout home. From its vantage point, you’ll be able to see the modern curved staircase, a pool/game area on the left, a small entertainment nook on the right and the kitchen on the far back. For this particular design, it really gives that feel of privacy, and the recess on the floor is quite deep. The living area is a circular cut-out from the polished dark oak floors, which is also mirrored by the circular recess of its ceiling. Although quite small, this makes for a very cozy sitting area, perfect for conversations and gives a feeling of privacy, encouraging communication among its users. The sofa is built-in on the recess and is upholstered in a bisque velvet fabric with a matching round ottoman at the center. It can be accessed via the two 4-level steps right beside the two semi-circular sofas. 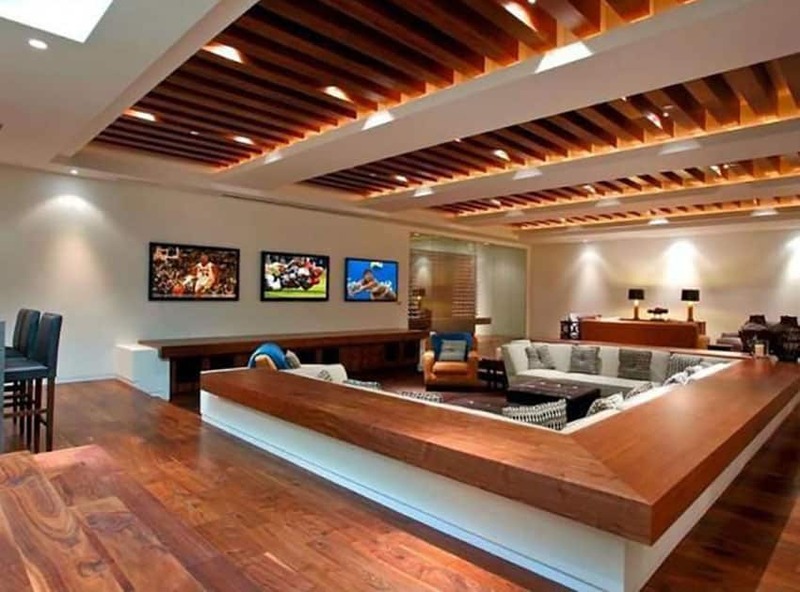 Sunken living rooms, or living rooms placed on a recessed floor level of a house, are typically employed on modern or contemporary homes, and is basically a modern idea. However, a similar, but subtler concept can be found applied even on older structures and homes. 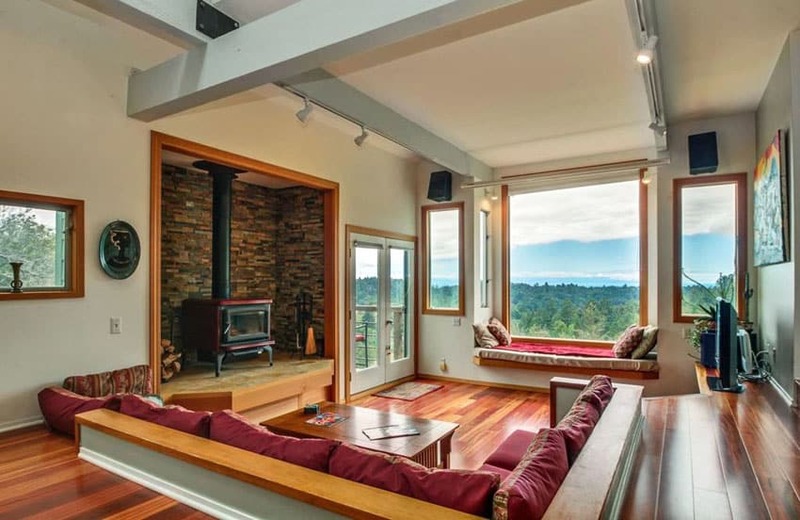 This type of living room allows the living room to feel like a separate space from the rest of the house, while still being able to employ on open layout for the space. Sunken Living spaces also defines a smaller area within a large floor plan, giving it a sense of privacy, as well as emphasis. You will find that this type of living room can also be seen applied on classic structures and a variety of architectural styles. It can be applied on French style homes, Mediterranean homes – your imagination is your limit. You just need to find the right balance of appropriate furniture pieces, materials and depth to make the look work according to the effect you are aiming for. Available space – determine if you have sufficient space for the sunken living area. As a general rule, they work best with larger spaces, especially those which uses an open floor plan. This and the next item in the guide go hand-in-hand, as you need to determine the amount of space you need for the type of sunken area you want to make. Intended use – this will help you determine the answer to the next item in this guideline. 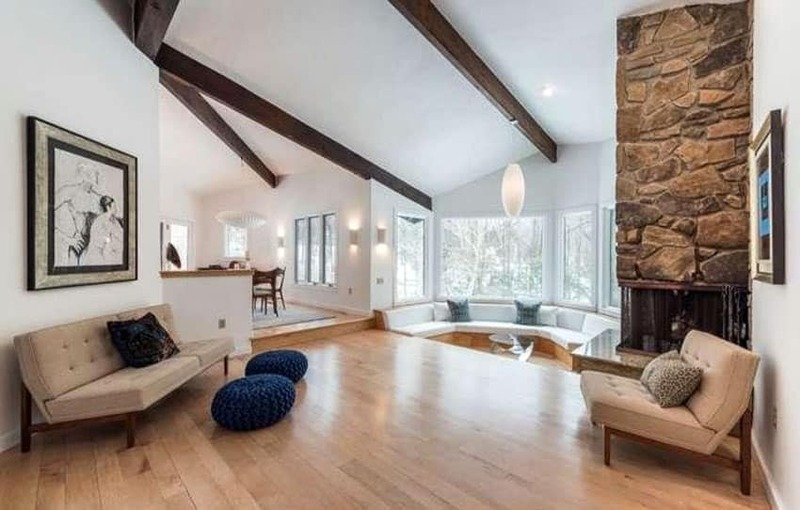 You need to determine what you intend for the space: a full living area, a small sitting area by the fireplace, a semi-private huddle area, a reading nook, etc. Depth of Sink/Recess – are you planning to do a shallow floor recess only? Or would you want a significantly lower floor level for the living room? Is it structurally possible to do for your space? After considering such aspects, you also need to take not the different advantages and disadvantages of sunken living rooms. Although it varies depending on the situation, space and application, below is a helpful general list of its advantage and disadvantages. It makes the living room feel more open without having to raise the ceiling height. Especially helpful for spaces with uniform ceiling heights – this gives the living area more emphasis. Separates spaces without using barriers or walls while creating a more private/intimate atmosphere within its bounds. Helps emphasize spaces and make it stand-out from the rest. Can be claustrophobic if too small. Can cause accidents, especially if the floor level change is subtle or not easily noticed. Could possibly cost a lot to build, especially if you’re simply renovating an existing space. 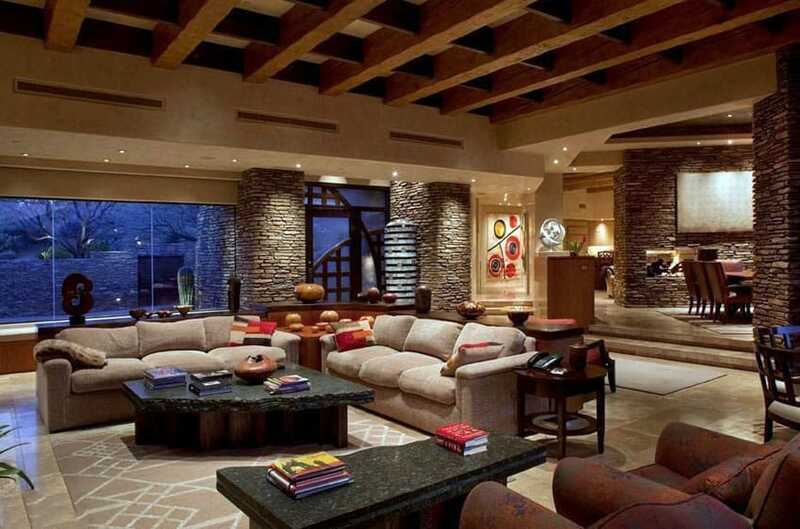 Below we have listed an excellent selection of sunken living room ideas. Examples from a variety of layout styles, as well as architectural and interior period styles can be found on this list. 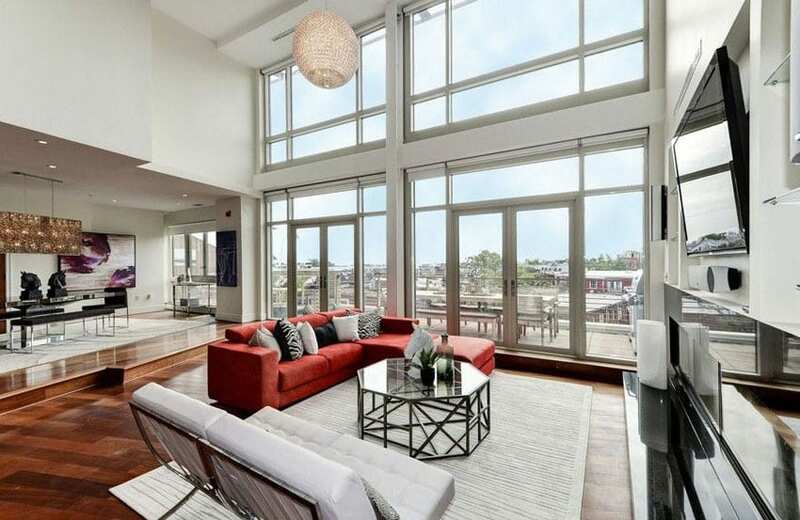 This is a gorgeous contemporary living space with an open floor plan. The living area is adjacent to the kitchen area and is separated by a long bar counter. The large living room area is only slightly sunken, so it doesn’t have that closed-off feel that deeper sunken living rooms usually have. Also, the lower floor level helps emphasize the high ceiling and the exposed I-beams of the structure. The wood beams, plain white paint and golden teak wood floors, doors and windows is a warm contrast against the industrial feel of the charcoal-painted metal beams. Furniture pieces are basic loose furniture pieces such as a large modular L-shape sofa with pebbled light gray upholstery, a leather bench, a black modern coffee table and a simple console table. The TV is built-in on the low media cabinet, creating an unobtrusive entertainment area. Unique architectural style of this house creates a unique and dynamic open layout for the the interiors. It has a high ceiling with skylight, making the interior even brighter, as most of its walls are fixed with floor to ceiling windows. Style-wise, it mixes different furniture styles, but keeps a neutral, muted color scheme for a well put-together look. The sunken living area has a unique shape which follows the geometry of the architecture. The area is quite large, an mainly serves as a sitting area or a receiving area, as it is not equipped with entertainment units. 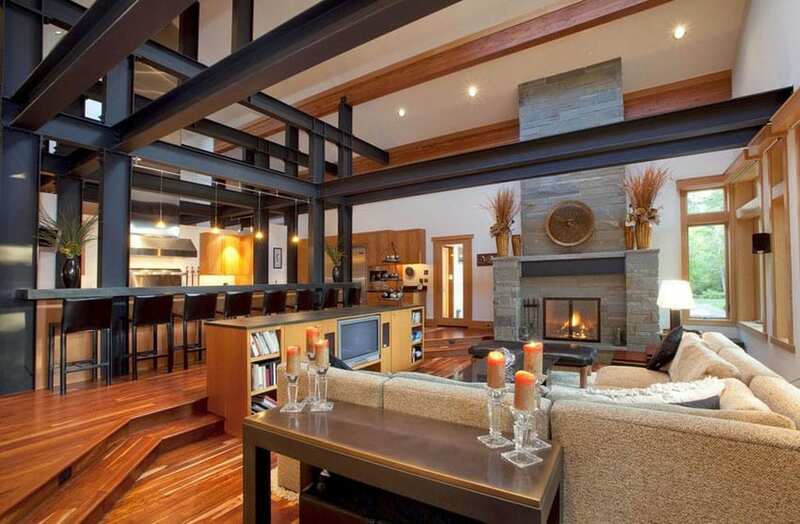 Modular sofas almost completely surrounds the sunken area, except for the fireplace and its steps. You will notice the use of Modern Modular sofas, Chinese lacquered table, classic French round area rug and other elements, creating a very eclectic mix. Unlike the previous examples of sunken living rooms which creates a very defined “separate” space, this examples offers a more subtle transition between spaces. 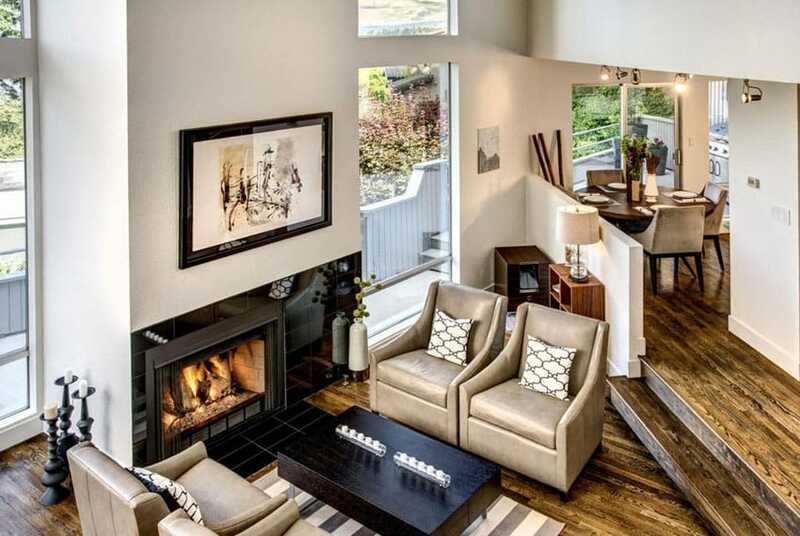 Instead of having 2 or more steps to access, this living area is only one stair step lower than the rest of the floor, allowing you to frame the space without making it look separated from the rest. This living room uses traditional Georgian-inspired furniture pieces, and gives a very elegant and formal atmosphere. Despite the luxurious upholstery and wood finishes, it does not look too intimidating as it uses plain white on its floors and walls, has a high ceiling and large windows, making the furniture pieces stand-out. Sunken floor levels are also perfect for TV rooms or entertainment areas as it gives it a more cozy feel. It also makes the room feel slightly bigger as it extends the ceiling height of the space. This examples is a simple modern TV room in an enclosed room with large picture windows. It is furnished with a large L-shaped modular sofa with brown crinkled upholstery, and paired with a leather-upholstered square ottoman, as well as two tub side chairs. The TV is fixed on an accent wall made up of square wood blocks of various wood species, adding a nice texture on the space while keeping with the color scheme. This is another subtle floor floor level change employed on the living area to give it a slightly separated feel, but still making it feel like it’s part of the rest of the space. It uses a very light color scheme made up of whites, creams and natural mahogany, which helps make the space look even bigger. The living area is 3 steps lower than the other floor levels, and is quite large. The furniture pieces doesn’t enclose the space, so there’s a lot of open spaces around it. Asian-inspired modern furniture pieces were used, like this wood-based platform L-shape sofa set with matching square coffee table and ottoman. You will also notice Buddha figurines around the area, and other Asian influences on its accessories. Going for a different approach, this living room is unique from the other examples as it shares the same floor level with the kitchen, instead of being on its own. The large living area is right beside a small kitchen, and employs a rustic transitional style, using classic furniture silhouettes combined with modern finishes, materials, and patterns. The area has a high ceiling with exposed wooden beams and rafters in dark oak finish, matching the floor finish to give a dark yet elegant base. The walls are painted in a light gray color, paired with white moldings for better contrast. For the living area, a large sectional sofa was used, along with a classic oak coffee table, a matching side table and an upholstered armchair. Color scheme is mainly composed of grays and muted blues, but to make it more lively, modern patters was thrown in on the pillows, as well as some touches of yellows and greens. 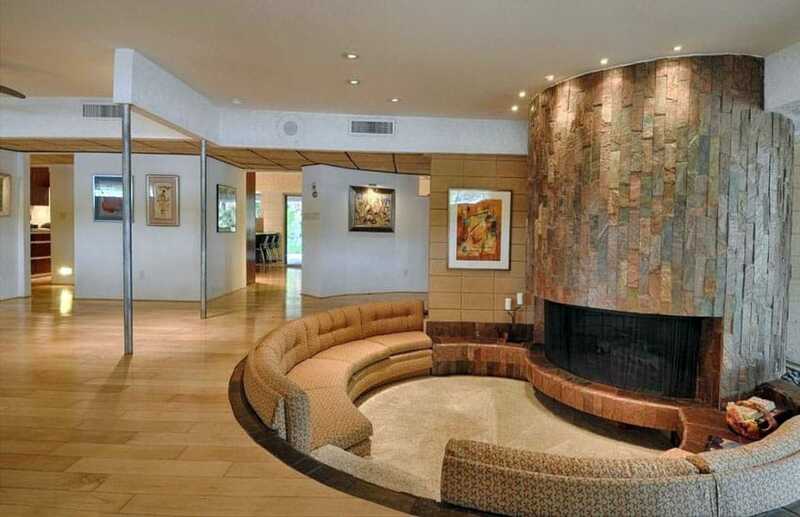 This example of a sunken living area is meant as a warm and cozy sitting area which was strategically placed right in front of the round fireplace. The round fireplace is built-in and is clad with natural stones, making it stand out from the plain white walls of the reset of the house. The living area us a little deep, and employs built-in chairs to fit the shape of the recess. This is actually a very ideal place to huddle together, relax and keep yourselves warm on a cold winter night. Unlike the other examples, this living area has a more “separate” feel as it has a lower ceiling height compared to the adjacent dining area, and the steps are blocked with two faux columns, creating an illusion of a partition. However, this also allows more privacy and gives it a more comfortable and cozy feel. Compared to the cool mint walls and cold marble tiles of the dining room, the living area uses warm chocolate brown walls and soft carpet flooring, creating a contrast in both texture and color. The living area has a casual set-up of velvet-upholstered furniture pieces, and a variety of accent pieces such as a side chair, a wooden bench and a stone coffee table. 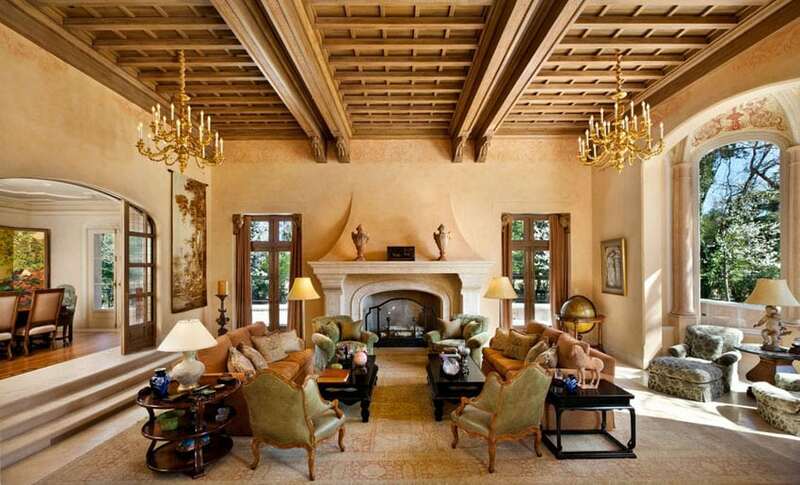 The area is simply but artfully decorated, giving it a very elegant appeal. This is another enclosed Living Area / TV Room, going for a more private & cozy atmosphere. To help with the acoustics, the area is fully enclosed, and can be accessed through a glass swing door. The area is 5 steps lower than the normal floor area, allowing you to have a little bit more ceiling height despite the size. All walls are clad in a unique wallpaper with faux nailhead squares, making the walls look like it was made out of metal. The Ceiling was painted in a mocha brown color to match the wood tone of the engineered wood flooring. As the space goes for a rustic industrial look, you will see the use of bronzed metal on the railings and shelves. For a more youthful feel, turquoise adds a welcome pop of color in the space, giving it a more vibrant vibe. 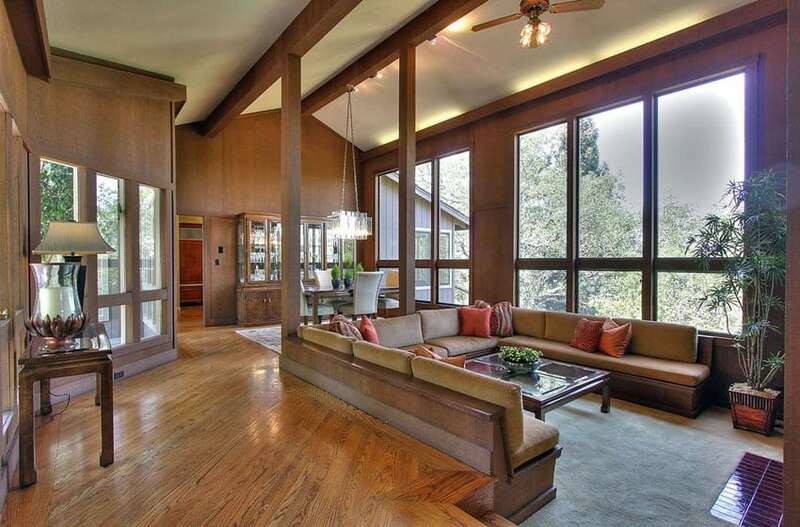 This formal living area is just two steps below the adjacent dining area, and is right beside the full-length windows and high sloped ceiling, making the area look bigger. Employing a modern transitional style and a warm neutral color scheme, this living room achieves a formal and elegant appeal, which would also look perfect on hotel or condominium lobbies or office waiting areas. There are two sectional loveseats, both of which were split into two, making it look like you have 4 armchairs. In the middle is a modern clear glass coffee table, and in between the sectional loveseats are wood stump side tables. 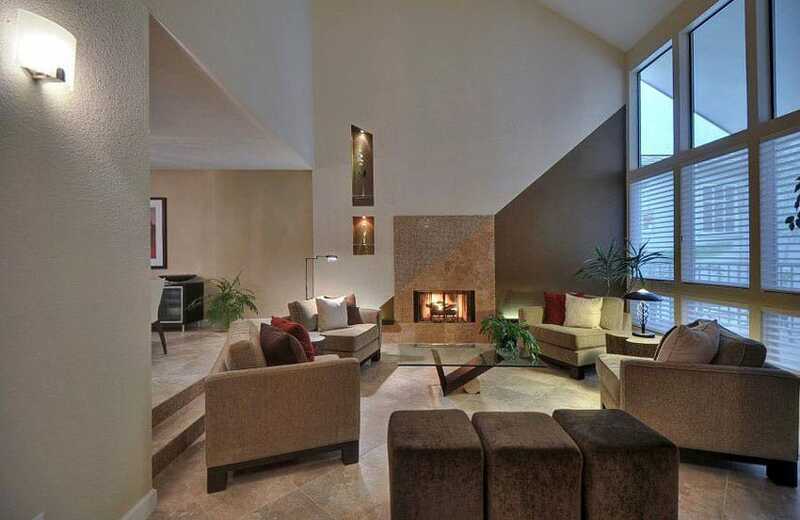 There’s also a built-in firepit on the accent wall, as well as niches for displays/decor. 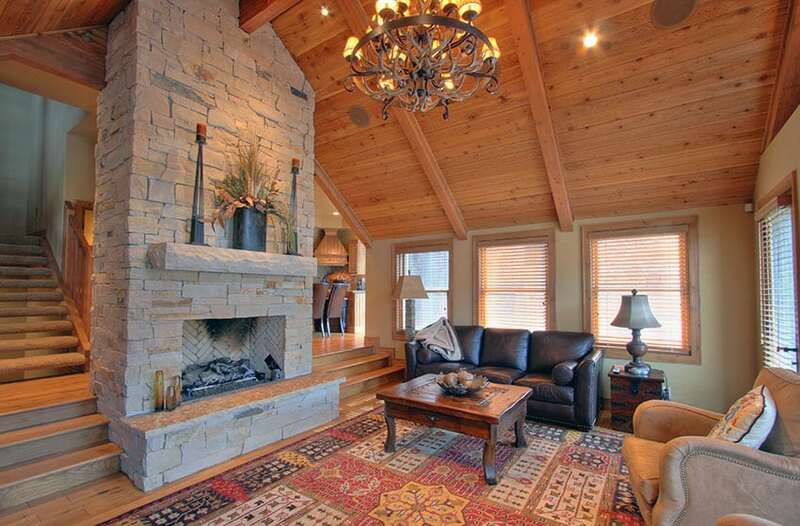 Pine wood ceiling planks with matching window frames sets a very warm atmosphere in this large living room. 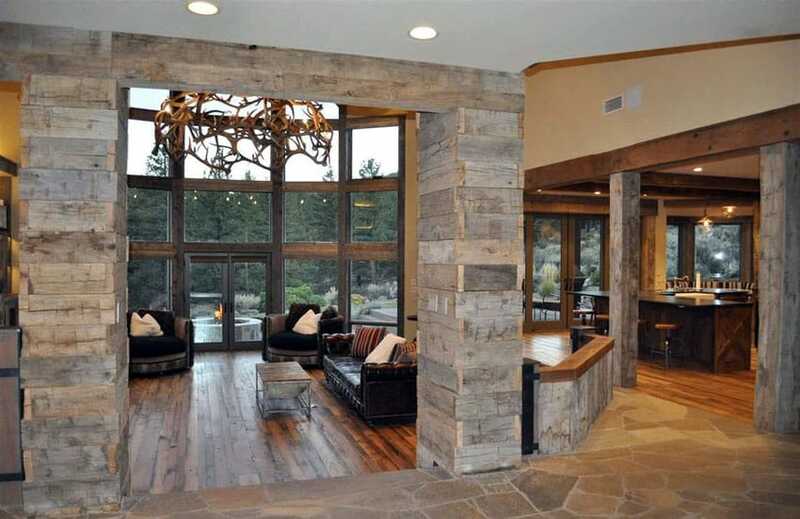 The walls uses a color similar to the pine wood, save for the accent wall where the fireplace was placed, which uses ceramic tiles with a unique rustic metal look. The living area is a low sink from the main floor, but easily distinguishable as it uses carpet flooring in contrast with the pine used on the main floor area. For he furniture pieces, 2 massive modular L-shape sofas frame the 2 corners of the room. You will also see 2 pics of a classic beregere in black leather upholstery and two matching silver & glass coffee tables. This sunken area in this house is a unique and serves as a private cozy spot, as it is more than 1 meter deeper than the main floor level, making the space almost enclosed. The living area was placed right by the long wall fixed with bookshelves, making it a perfect spot for reading. The sunken area has an irregular shape, but the sofa was built in right against its rounded edges. 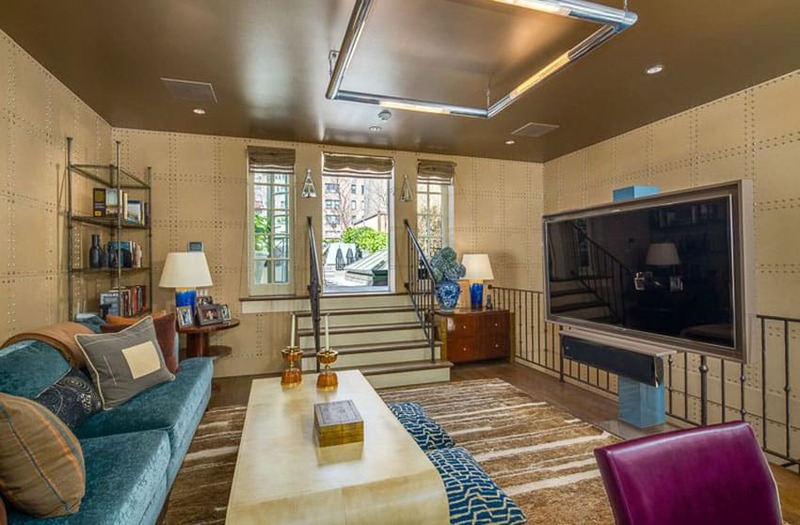 Appearing almost camouflaged would be the most unique quality of this sunken living area. This is located right in between the bar/kitchen area and the formal living area, and serves as the entertainment / TV area. The high seat capacity and large floor area it occupies also makes it an ideal point of convergence of the house. To hide the change in floor levels between the two areas, instead of leaving the floor transition open, it attached a low built-up wall and put a thick wood top right above it, framing and making the area semi-enclosed. As the height of the wall with ledge was kept low, it simply appears like a low console table or a piece of a low built-in shelf. It perfectly conceals the back of the U-shaped modular sofas, giving it a wall to lean upon. Style-wise, it is very contemporary but not overly modern, employing matching Teak wood fining on all wood elements for a well-coordinated look. Walls and ceiling area simply painted in white, the ceilings having a few teak wood slats on its recessed areas for accent. Making the most of an irregular layout, this design manages to create a small and private sitting area on the awkward corner left by the partition wall. It is just two steps from the main floor level, and has a half partition wall to give the space more privacy. Because of the limited space, you will only see 4 matching armchairs with beige leather, 2 storage shelves, some accessories, an ebony coffee table and a modern fire place recessed on the wall. The color scheme goes for a rustic appeal combined with the simplicity and clean, sleek feel of modern designs. Flooring is a very bold solid fruitwood, and you will also see a variety of wood species colors throughout the space. 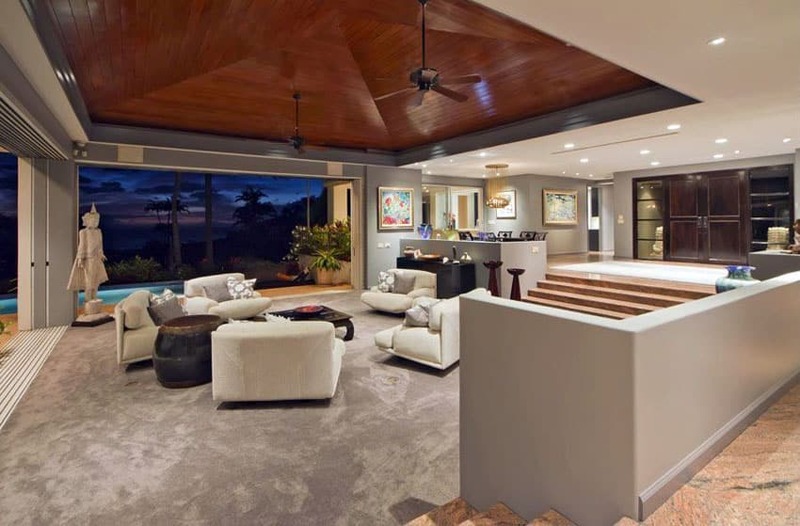 Placed just right after the last landing of the main staircase, this sunken living area ensure a grand and comfortable arrival for its occupants, or a cozy waiting or receiving area. 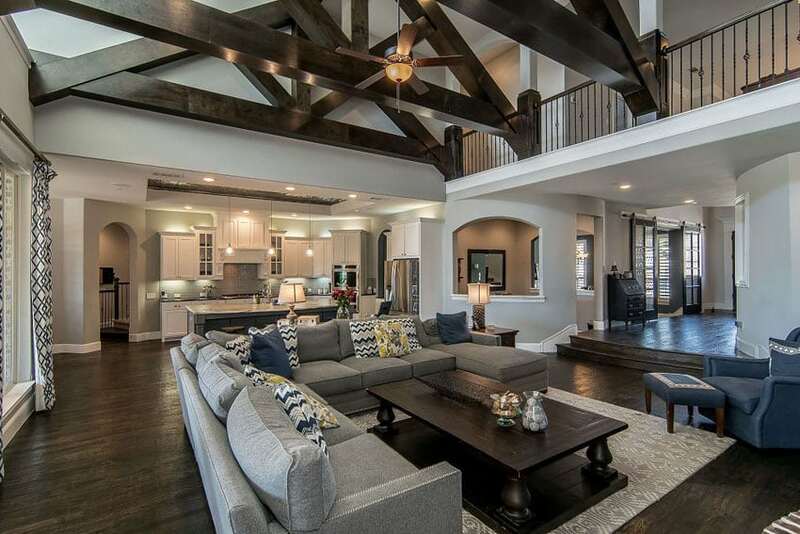 It has very intimidating Medieval Age-inspired interior architectural details such as the exposed wood columns and ceiling trusses, the use of off-white paint walls attempts to tone it down, lessening the dark shadow cast by the cherry wood flooring and the dark oak wood used on the columns & trusses. The furniture in the sunken living area also attempts to soften it up, using light yellow-toned fabrics for upholstery, as well as light-colored traditional area rug. A pair of chesterfield sofas, an x-franed coffee table, 2 classic bergere and an inlaid side table composes the main elements of the room. Compared to the other sunken living room examples, this one is longer, allowing you to create two separate sitting areas, or combine them as needed. It feels like a different room, although it employs an open layout, because the ceiling height for the living room is a lot higher than the other parts of the house and the floor level is 4 steps lower. Since the interior architectural details of the house has a classic European look – walnut floors, matching walnut windows and doors, yellow walls and stained glass – it compensates with its use of plain-colored furniture pieces, balancing the look. Luxury and elegance can clearly be felt in this small sunken living area. Just two steps down the main floor level and framed by 4 classical order columns, the area looks very defined as it uses cherry wood flooring as opposed to the polished granite of the main floor area. Aside from that, there’s a large Turkish Area Rug which further emphasizes the living area, especially since all fabrics used in the furniture is white. High ceiling, large windows and a gorgeous view of the neighborhood, this modern sunken living room is a dream come true for many. The use of basic white on the walls, ceiling, doors and windows allows you to the flexibility and freedom to add on other bolder colors in your furniture or accessories. 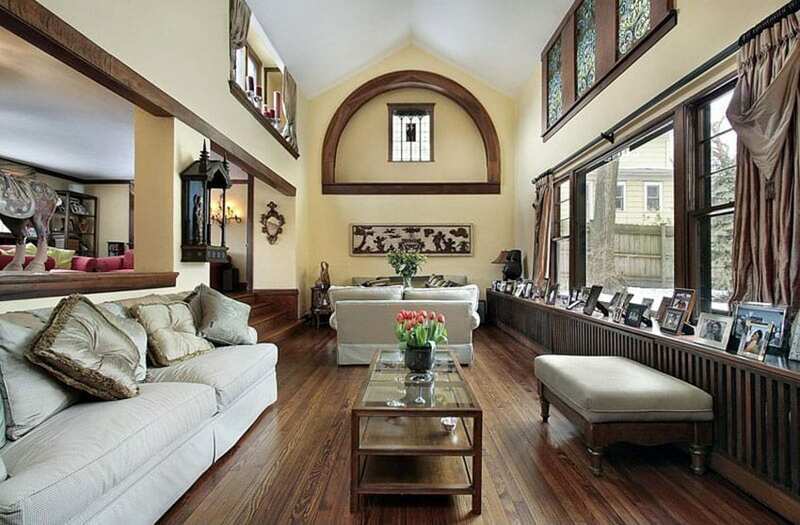 In this example, the living room was framed with white modern area rug to frame it against the Mahogany flooring. While most of the pieces of furniture seen in the room uses a basic black, white and stainless steel finish, the L-shape sofa is a definite stand-out with its fiery brick red velvet upholstery and animal print throw pillows. This design shows a two-level sunken living area. Directly parallel to the dining area and just one step down is the main sitting area with beech wood floors, and perpendicular to the dining room and right by the bay window is an even deeper sunken area with built-in bench seats that follows the shape of the window walls. This is a great huddle area, reading nook, or a perfect place to have your afternoon coffee or tea. The design of this home is inspired by classic European styles and furniture pieces, and foes for a simplified version of the classic look by using a basic neutral palette, making it easier on the eyes. The palette basically consists of creams, golds and Mahogany, creating a very warm and cozy atmosphere that would remind you of hotels or spas. 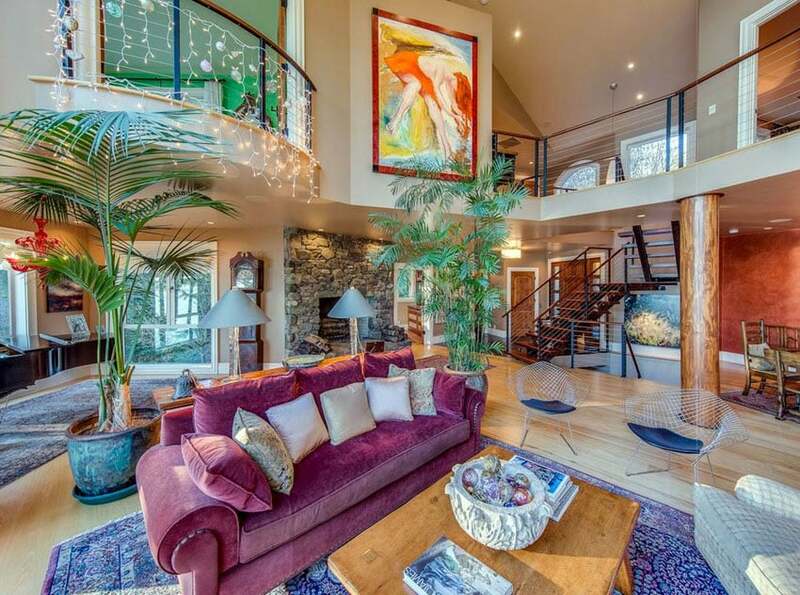 The large formal living area is placed right beside the main staircase and can be overlooked from the second floor hallway/mezzanine. 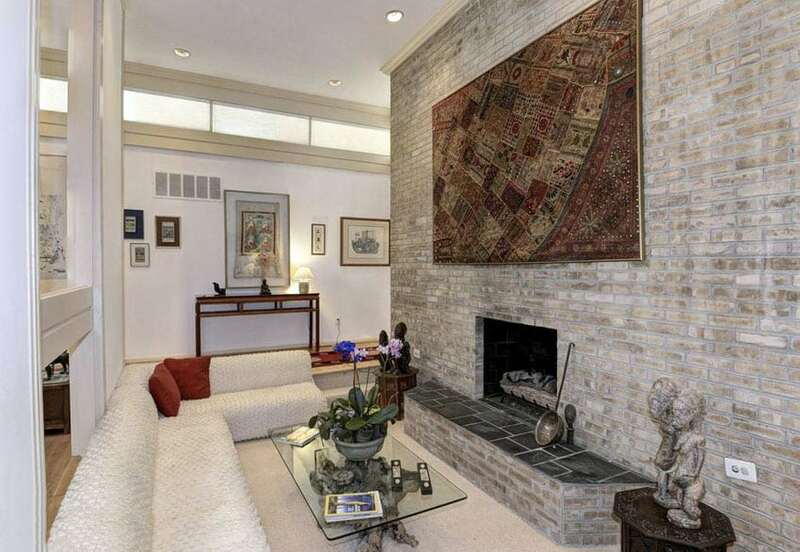 The living room area is only slightly sunken, and is framed by a very large traditional area rug. There are 3 sofas, 2 heavy solid wood coffee tables, an armchair, an electric fireplace fixed on a porcelain tile-clad accent wall and other matching accessories to complement the look. This is another classic European style sunken living room, but this one is semi-enclosed and is right beside the formal dining area. 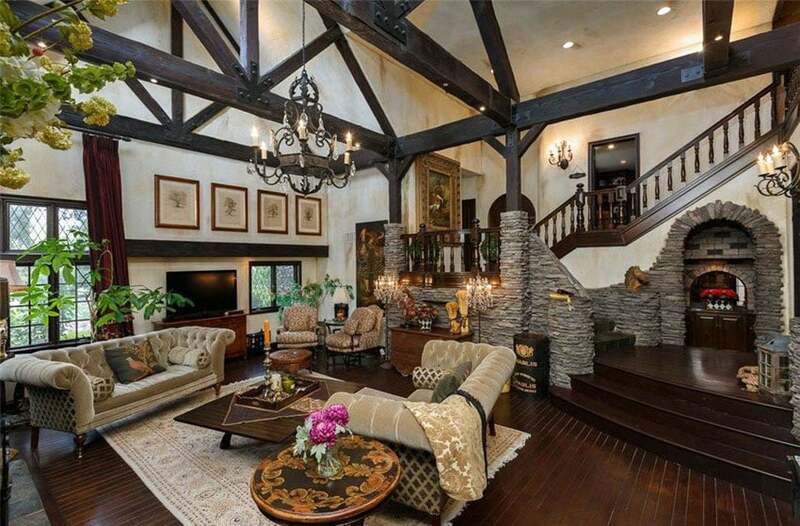 It has a high ceiling with rustic wood slats and solid wood beams with corbel accents and 2 classic gold chandeliers. It uses a neutral color palette as well, mainly composed of rust brown and creams, but it also adds a subtle pop of sage green on the armchairs and lounge chairs, adding a cool and refreshing tone in contrast with the warm basic finishes. 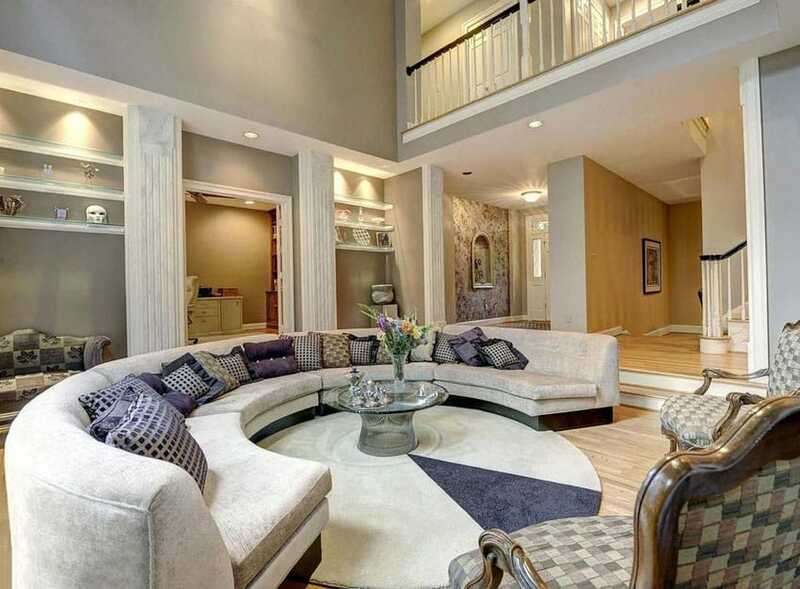 This contemporary sunken living room is an eclectic mix of different furniture styles. Tables are all matching, made from heavy wood and has a very Colonial period look. The dark brown leather sofa and the high back white bench seat on the other hand, are modern pieces. Some French provincial elements can be found as well, but given a contemporary twist, just like the stone wall with an irregular shape, display niches and even a built-in fireplace with iron railing. This sunken living room is actually a multi-functional area. When the folding doors are closed, this is simple a living area with a nice view of the pool area, but when you open the two walls with folding doors, the living area looks more like a covered patio area. As it goes for a more casual feel, the plush armchairs are not arranged symmetrically and it also doesn’t have an area rug to frame the area. 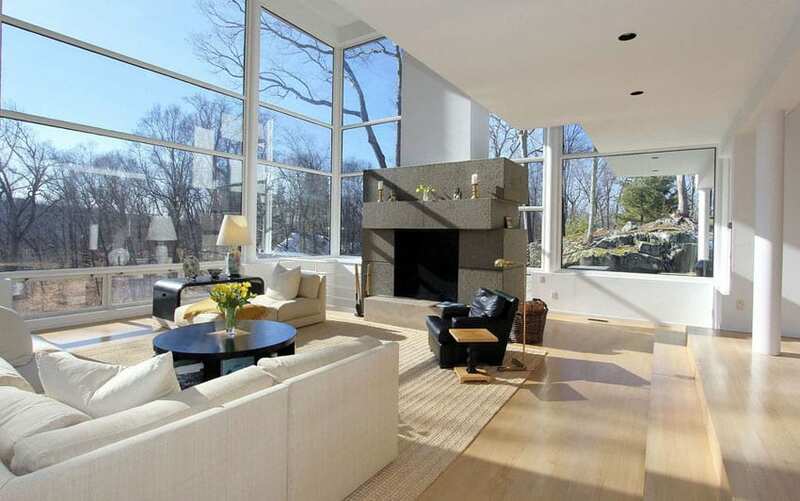 A gorgeous contemporary living room with massive windows, high ceiling, and a stunning outdoor view to boast about. This living room goes for a more minimalist style, preferring light basic finishes and very simple furniture silhouettes. Walls, ceiling, doors and windows are all white, while the flooring is light maple to give a subtle warm undertone in the space. The modern fireplace on one wall is clad with gray stone tiles, while the furniture pieces are all upholstered in off-white cream, except for the black leather accent armchair. 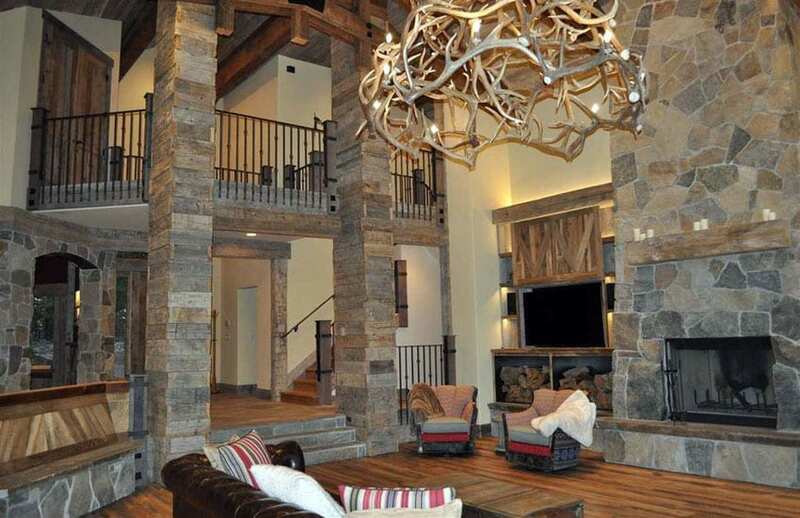 The extensive use of natural stone cladding combined with reclaimed wood on the columns and ceiling gives this large sunken living room an even more intimidating feel, especially since it also as a very large wood branch chandelier hanging right above. Although the walls were painted in a light yellow color, the natural greens and cool tones on the stones gives a somber, cabin-like feel to the space. Furniture pieces does not stick to any particular style, but colors selected are dark, with accents of red and white. A different perspective of the sunken living room shown above. From this angle you can see the custom distressed wood pillars and open layout that flows from the living area to the kitchen. 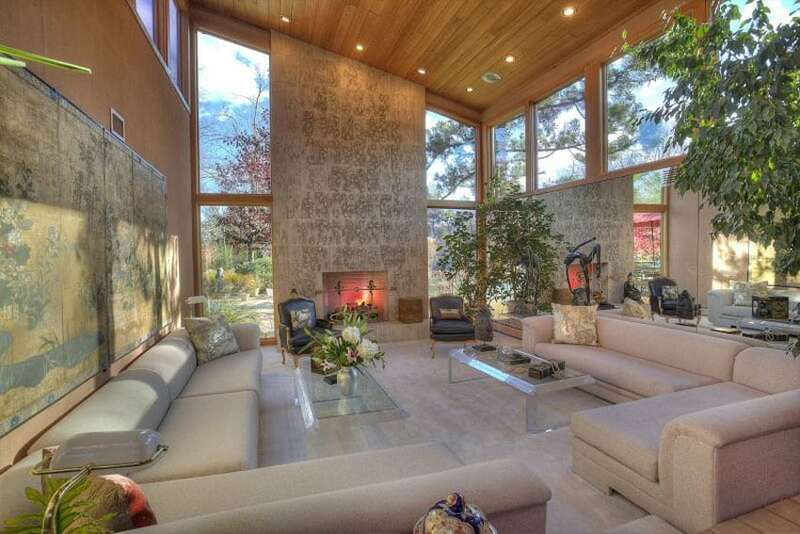 The living room’s high ceiling and wall of windows offers excellent views of the backyard with deck and fire pit. High sloped ceiling and natural Pine wood finish reflected on both the ceiling and floors makes a pleasantly warm ambiance. The living area is the lowest level of the house and has direct access to both the main stairs and the dining area, with only a fireplace wall acting as a partition or divider. The casual living area has a simple black leather sofa and a beige velvet armchair on the side, with a matching mahogany coffee table and side table. This sunken sitting area was made to maximize the warmth of the built-in fireplace by surrounding the front of the fireplace with modular sofas. The lower floor level helps keep the heat most concentrated on the area, making it a perfect spot for colder months. The fireplace is very minimalist, and actually just looks like a hold in the middle of a rustic brick-clad accent wall. Despite the rustic and earthy feel of the accent wall, the general style of the house is actually very contemporary, with plush white seats and a generally light color scheme. Reflecting irregular geometry of the architecture, this sunken living area is placed on a uniquely shaped floor recess and conveniently placed in front of the built-in fire place. The space looks bright and simple as it all furniture pieces uses white leather upholstery for a modern look. Since this area uses folding glass door panels, the area is multi-purpose. All the doors and windows can be folded, making the area open to the pool area, therefore explaining the use of the same flooring material as the poolside area. Most sunken living rooms only use round/semi circular furniture pieces to follow the shape of the floor recess. 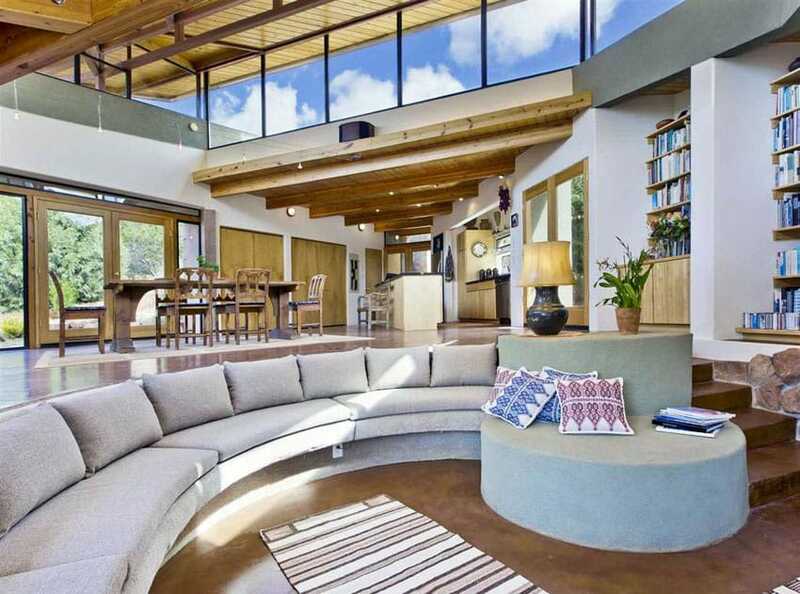 However, this particular example uses a massive semi-circle sectional sofa in a square-cut shallow floor recess. High ceiling and light gray walls creates a bright and cool ambiance to match the general color scheme of the living room which is composed of cool-toned neutrals, deep purples and blues. 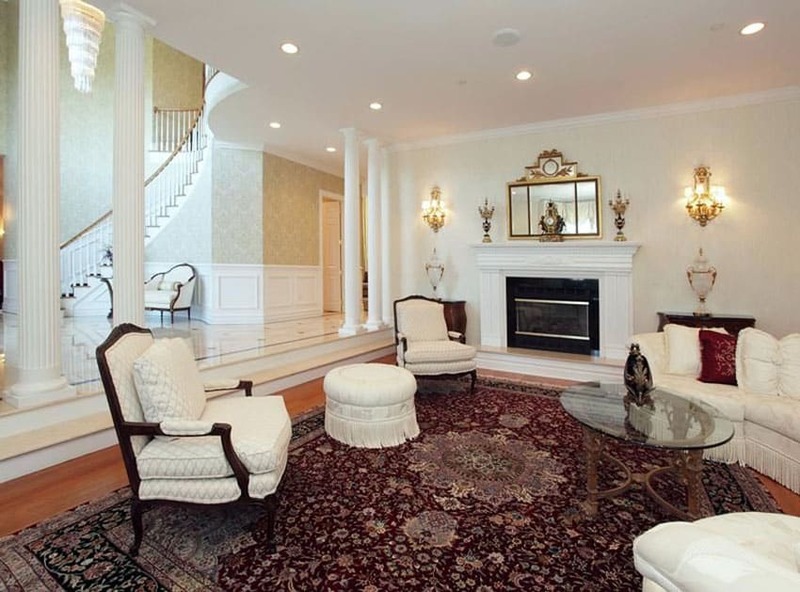 The semi-circular sofa has a complementary round area rug, a round glass coffee table, and 2 classic Rococo fauteuils. A Mediterranean-inspired living space which also combines modern and classic elements in the furniture pieces and architectural details. 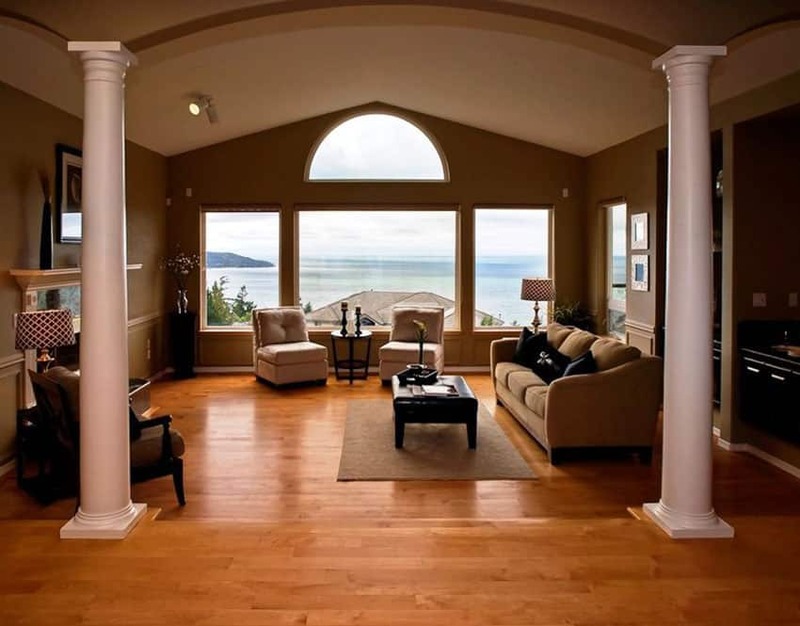 Placed in a shallow floor recess right beside the picture windows and sloped ceiling, the area enjoys a natural light and a gorgeous view of the sea. The entrance to the area is marked with two Tuscan columns, framing the area as separate without the use of a partition. Furniture pieces uses earth-toned warm colors like a rusty yellow for the sofa and a dark mocha for the armchair. Consistent with the warm and rustic look of the architecture and the other spaces, this sunken living room uses the same wood finishes, as well as appropriate upholstery colors to match the general look. The large area has a significantly lower floor level, easily defining the space. This also adds additional privacy and a sense of intimacy to the space, without being claustrophobic as the area is quite spacious. The built-in in U-shaped bench seat with loose seat and back cushions provides a cozy and comfortably atmosphere, and is able to accommodate a large number of users, making it an excellent gathering space for the whole family, occupants or guests. Smaller spaces are usually not ideal candidates for application of sunken living rooms, but this example shows an example applied on a smaller space. This sunken living room is almost as high as the L-shape bench’s backrest, creating a private and cozy atmosphere. The size and location of the area is perfect for viewing the outdoors through the large picture windows opposite the sofa, and also a great place to gather by the fireplace during colder months. 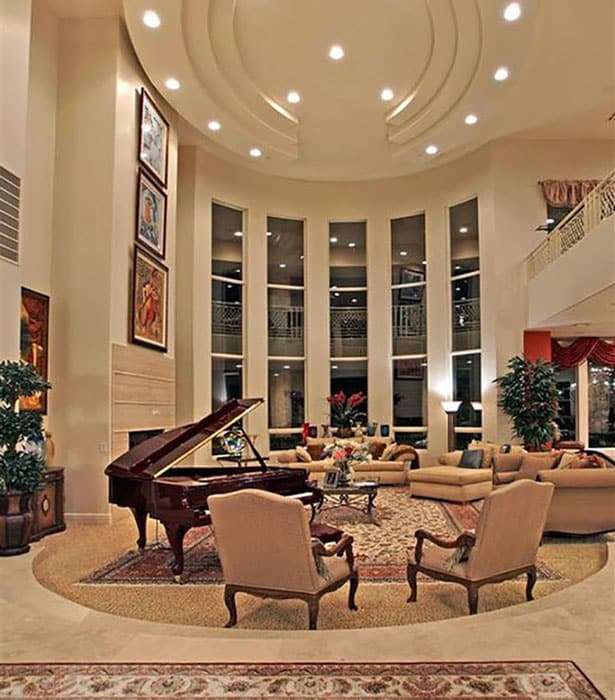 A grand living area with a very high ceiling and spacious floor space, classic furniture pieces and a pleasing color scheme which creates a look that seems straight out of a high-society magazine. The sizable living area is on a shallow floor recess and uses carpet flooring instead of marble to easily see the floor level change. The area has matching humpback sofas and armchairs, two Renaissance armchairs with beige linen upholstery and a grand piano, making the area even look grander. The interior architectural elements of this space is very modern, from its open floor plan, high ceiling, light-colored walls and floors, as well as modern stairs and railings. The colors and finishes of the interiors leans towards Art Deco style, while the furniture pieces used inside is definitely an eclectic mix of period styles and colors. In the living room alone, you will see that the area is framed with traditional style area rug, but uses more vivid colors, drawing attention into the area. The classic rolled arm sofa it uses is upholstered in red-violet velvet fabric and framed with tall interior plants. The accent chairs are two Diamond chairs by Bertoia which is a Mid-Century modern piece, while the basic coffee table is an Asian-inspired piece. In an attempt to bring the elegance of classic interiors, many sunken living room ideas use Victorian style furniture pieces which are basically exaggerated silhouettes of classic furniture pieces. The furniture pieces in this room nicely complement the classic English architectural details, and does not appear tacky as the colors used are muted purples combined with light neutral tones. 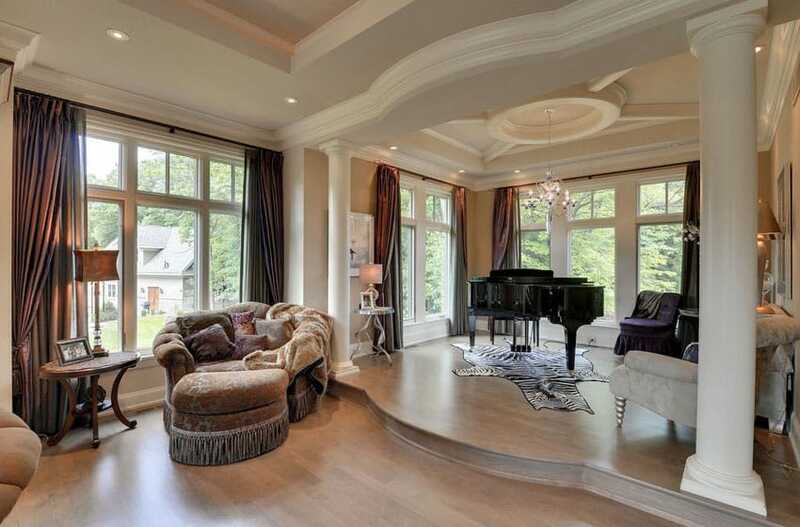 The living room also showcases the black grand piano on a raised floor surrounded by windows to create the perfect place for performing for friends or family. A large floor area, high ceiling, dramatic lighting and a well-decorated second floor balcony overlooking the living area, this design definitely looks grand, yet manages to keep a more casual and comfortable vibe, instead of being too intimidating. It employs a simple color scheme of creams and rusty orange throughout the sunken living area, and also uses consistent style for the seating furniture, creating a very well-coordinated look.